From the Department of Neurology, Maryland Epilepsy Center (A.K. ), and Department of Neurology (A.M.S., A.A.K., J.P.M., J.L.H. ), University of Maryland School of Medicine, Baltimore; US Department of Veterans Affairs (A.K. ), Maryland Healthcare System, Epilepsy Center of Excellence, Baltimore, MD; Department of Clinical Neuroscience (S.W. ), University of Calgary Faculty of Medicine, Canada; Department of Neurology (G.S.G. ), University of Kansas School of Medicine, Kansas City, KS; Department of Neurology (D.S.G. ), Geisinger Health System, Danville, PA; Department of Emergency Medicine (A.T.L. ), George Washington University School of Medicine, Washington, DC; Department of Neurology (A.M.K. ), International Center for Epilepsy, University of Miami Miller School of Medicine, FL; Departments of Neurology, Pediatrics, and Epidemiology & Population Health (S.S.), Albert Einstein College of Medicine, Yeshiva University, Bronx; and New York University Comprehensive Epilepsy Center (J.A.F. ), New York, NY. Objective: To provide evidence-based recommendations for treatment of adults with an unprovoked first seizure. Methods: We defined relevant questions and systematically reviewed published studies according to the American Academy of Neurology's classification of evidence criteria; we based recommendations on evidence level. Results and recommendations: Adults with an unprovoked first seizure should be informed that their seizure recurrence risk is greatest early within the first 2 years (21%–45%) (Level A), and clinical variables associated with increased risk may include a prior brain insult (Level A), an EEG with epileptiform abnormalities (Level A), a significant brain-imaging abnormality (Level B), and a nocturnal seizure (Level B). Immediate antiepileptic drug (AED) therapy, as compared with delay of treatment pending a second seizure, is likely to reduce recurrence risk within the first 2 years (Level B) but may not improve quality of life (Level C). Over a longer term (>3 years), immediate AED treatment is unlikely to improve prognosis as measured by sustained seizure remission (Level B). Patients should be advised that risk of AED adverse events (AEs) may range from 7% to 31% (Level B) and that these AEs are likely predominantly mild and reversible. Clinicians' recommendations whether to initiate immediate AED treatment after a first seizure should be based on individualized assessments that weigh the risk of recurrence against the AEs of AED therapy, consider educated patient preferences, and advise that immediate treatment will not improve the long-term prognosis for seizure remission but will reduce seizure risk over the subsequent 2 years. An estimated 150,000 adults present annually with an unprovoked first seizure in the United States.1 Even one seizure is a traumatic physical and psychological event that poses difficult diagnostic and treatment questions, and has major social consequences (e.g., loss of driving privileges, limitations for employment).2,3 Recurrent seizures pose even more serious and costly problems.2,–,4 Therefore, optimal evidence-based approaches for evaluating and managing adults after a first seizure and preventing recurrences with antiepileptic drug (AED) therapy are important. A 2007 practice guideline addresses the evaluation of an unprovoked first seizure in adults3; the present practice guideline analyzes evidence regarding prognosis and therapy. This practice guideline considers the evidence for prognosis and treatment of adults with an unprovoked first seizure; a 2003 guideline addresses this for children.8 We posed 3 questions: (1) What are the risks for seizure recurrence after a first seizure? (2) Does immediate treatment with an AED reduce or change (a) short-term risks for a seizure recurrence or (b) long-term prognosis for seizure freedom or remission? (3) For those patients prescribed AEDs immediately, what are the risks for adverse events (AEs)? We identified 2,613 articles, obtained all in abstract form, and selected 281 for full-text review. Of the selected articles, 47 were judged relevant and acceptable. We systematically reviewed and rated the 47 articles according to the AAN classification of evidence scheme for prognostic or therapeutic articles (appendix e-5). We linked recommendations to evidence strength based primarily on studies rated Class I or II (appendix e-6). Appendix e-7 presents all rated articles. Tables e-1 through e-4 show the data. For the adult who presents with an unprovoked first seizure, what are the risks for seizure recurrence? We identified 2 prognostic Class I10,–,14 and 8 prognostic Class II studies15,–,22 addressing the probability that an adult with an unprovoked first seizure would have recurrent seizures, and estimated the recurrence risk from these pooled data, which included studies wherein AED treatment was not randomized or controlled (table 1, figure 1). Generalized tonic–clonic convulsive seizures comprise the major seizure type, with some studies including only patients with such seizures.12,13,17,22 These studies, including both AED-treated and untreated subjects, demonstrate that the cumulative incidence of seizure recurrence increases over time, with the great majority of recurrences occurring within the first 1 to 2 years after the initial seizure and the greatest risk in the first year (i.e., 32% at 1 year, compared with just 46% by 5 years) (table 1, figures 1 and 2). Patient ascertainment and treatment differences among studies may account for some of the wide variation in recurrence rates observed. If recruitment into trials is delayed by weeks or months, patients may experience a recurrence and become ineligible.11,12,15,16 Also, seizure recurrence was lower for patients treated with AEDs in most of these studies, but treatment often was not randomized.10,11,16,17,19,20 These 2 factors would lead to variability and underestimation of recurrence risk. This graph is based on a fixed-effect pooled percentage model from data in table 1 and shows the cumulative average and the range for each time period from 1 month to more than 5 years. Based on data from studies including mixed cohorts of both AED-treated and untreated subjects, an adult with an unprovoked first seizure is at greatest risk of a recurrence relatively early, within the first 2 years (21%–45%), and especially in the first year (2 Class I studies, 8 Class II studies), and this risk appears to be lower for patients treated with AEDs. The risk of seizure recurrence increases in certain clinical circumstances. These include a prior brain lesion or insult causing the seizure (2 Class I studies, 2 Class II studies), an EEG with epileptiform abnormalities (2 Class I studies, 4 Class II studies), a significant brain-imaging abnormality (2 Class II studies, 1 Class III study), and a nocturnal seizure (2 Class II studies). To evaluate evidence as to whether immediate AED treatment of an unprovoked first seizure in adults changes prognosis, we considered (1) the short-term risk for a seizure recurrence, and (2) the longer-term potential for seizure remission. For the adult presenting with an unprovoked first seizure, does immediate treatment with an AED change the short-term (2-year) prognosis for seizure recurrence? For adults presenting with an unprovoked first seizure, immediate AED therapy as compared with no treatment is likely to reduce absolute risk by about 35% for a seizure recurrence within the subsequent 2 years (1 Class I study, 4 Class II studies) but might not affect QOL (1 Class II study). For the adult presenting with an unprovoked first seizure, does immediate treatment with an AED as compared with delay pending a seizure recurrence influence prognosis, such as the potential for seizure remission over the longer term (>3 years)? We identified 1 Class I study12,–,14 and 1 Class II study15 addressing this issue and longer-term prognosis (table 3). The generally accepted metric for assessing long-term outcome and prognosis is the seizure remission rate, which is a measure of maintaining seizure freedom for a specified time duration, typically 2 to 5 years.12,–,15 Studies demonstrate that immediate AED treatment after an unprovoked first seizure as compared with treatment delayed pending another seizure does not increase the incidence of sustained seizure remission (table 3). Long-term survival is addressed only in 1 Class III study,27 which, although limited by sample size, notes that immediate treatment does not affect mortality over a 20-year period. For adults presenting with an unprovoked first seizure, immediate AED treatment as compared with treatment delayed until a second seizure occurs is unlikely to improve the chance of attaining sustained seizure remission over the longer term (>3 years) (1 Class I study, 1 Class II study). For the adult who presents with an unprovoked first seizure, what are the nature and frequency of AEs with AED treatment? For adults with an unprovoked first seizure immediately treated with AEDs, studies of the nature and incidence of AEs indicate a wide range of predominantly mild and reversible AEs that occur in approximately 7% to 31% of patients (4 Class II studies, 1 Class III study). Adults presenting with an unprovoked first seizure should be informed that the chance for a recurrent seizure is greatest within the first 2 years after a first seizure (21%–45%) (Level A). Clinicians should also advise such patients that clinical factors associated with an increased risk of seizure recurrence include a prior brain insult such as a stroke or trauma (Level A), an EEG with epileptiform abnormalities (Level A), a significant brain-imaging abnormality (Level B), or a nocturnal seizure (Level B). Clinicians should advise patients that, although immediate AED therapy, as compared with delay of treatment pending a second seizure, is likely to reduce the risk of a seizure recurrence in the 2 years subsequent to a first seizure (Level B), it may not improve QOL (Level C). Clinicians should advise patients that over the longer term (>3 years), immediate AED treatment is unlikely to improve the prognosis for sustained seizure remission (Level B). Patients should be advised that their risk for AED AEs ranges from 7% to 31% (Level B) and that these AEs are predominantly mild and reversible. For a patient with a first unprovoked seizure, the chance for a seizure recurrence can be estimated and stratified on the basis of clinical factors, with greater risk associated with a prior brain insult or lesion as the cause of the seizure, an EEG with epileptiform abnormalities, a significant brain-imaging abnormality, or a nocturnal seizure.3,16,17,23,24 Such risk stratification may help guide physicians counseling patients about their risks for seizure recurrence and options for management. In some instances, a patient's statistical risk for a seizure recurrence may approach that of patients for whom immediate AED treatment is generally accepted, such as those who have already experienced multiple seizures.12,13,15 A recent report from the International League Against Epilepsy (ILAE) promotes a new practical clinical definition of epilepsy that emphasizes the importance of estimating recurrence risk for individuals with a first unprovoked seizure.34 The ILAE expanded the diagnosis of epilepsy beyond the prior standard requiring at least 2 unprovoked seizures to encompass people with an unprovoked seizure and a high (at least 60%) risk of seizure recurrence over the subsequent 10 years. However, as our analysis indicates and the ILAE cautions, the lack of evidence regarding specific risk factors and their interactions poses limitations. The issue of exactly how to use complicated risk data of recurrences and seizure remission to guide management is a question that warrants further research and clarification.34 Predictive statistical models to analyze such risks, although complex and difficult, have been demonstrated to be feasible and potentially useful.25,37 These types of predictive models and analyses would benefit from additional data on the extent, potential additive effects, and timing of seizure recurrence risks associated with specific clinical variables, such as seizure etiology, EEG findings, and brain imaging. It would also be important to determine the degree to which AED treatment may influence the risk of seizure recurrence for each of those clinical factors taken individually or together. Allan Krumholz: study concept and design, acquisition of data, analysis or interpretation of data, drafting/revising the manuscript, critical revision of the manuscript for important intellectual content, study supervision. Sam Wiebe: acquisition of data, analysis or interpretation of data, critical revision of the manuscript for important intellectual content. Gary Gronseth: study concept and design, acquisition of data, analysis or interpretation of data, drafting/revising the manuscript, critical revision of the manuscript for important intellectual content. David Gloss: study concept and design, acquisition of data, analysis or interpretation of data, drafting/revising the manuscript, critical revision of the manuscript for important intellectual content. Ana Sanchez: acquisition of data, analysis or interpretation of data, drafting/revising the manuscript, critical revision of the manuscript for important intellectual content. Arif Kabir: acquisition of data, analysis or interpretation of data, drafting/revising the manuscript, critical revision of the manuscript for important intellectual content. Aisha Liferidge: acquisition of data, analysis or interpretation of data, drafting/revising the manuscript, critical revision of the manuscript for important intellectual content. Justin Martello: acquisition of data, analysis or interpretation of data, drafting/revising the manuscript, critical revision of the manuscript for important intellectual content. Andres Kanner: acquisition of data, analysis or interpretation of data, drafting/revising the manuscript, critical revision of the manuscript for important intellectual content. Shlomo Shinnar: study concept and design, acquisition of data, analysis or interpretation of data, drafting/revising the manuscript, critical revision of the manuscript for important intellectual content. Jennifer Hopp: acquisition of data, analysis or interpretation of data, drafting/revising the manuscript, critical revision of the manuscript for important intellectual content. Jacqueline French: study concept and design, acquisition of data, analysis or interpretation of data, drafting/revising the manuscript, critical revision of the manuscript for important intellectual content, study supervision. This guideline was developed with financial support from the American Academy of Neurology. A. Krumholz serves on the editorial board for Clinical EEG and Neuroscience, and has received royalties from UpToDate. S. Wiebe has received research funding from the Alberta Heritage Medical Research Foundation, the Canadian Institutes for Health Research, the M.S.I. Foundation of Alberta, and the Hotchkiss Brain Institute of the University of Calgary. G. Gronseth reports no disclosures relevant to the manuscript. D. Gloss is a paid evidence-based medicine consultant for the American Academy of Neurology. A. Sanchez, A. Kabir, A. Liferidge, and J. Martello report no disclosures relevant to the manuscript. A. Kanner serves as a journal editor for Epilepsy Currents and as a regional editor for Epileptology; serves on the editorial boards of Epilepsy & Behavior and CNS Spectrums; and has received royalties for Psychiatric Issues in Epilepsy, Second Edition: A Practical Guide to Diagnosis and Treatment; Psychiatric Controversies in Epilepsy; and Depression in Neurologic Disorders. S. Shinnar has served on scientific advisory boards for Acorda, Questcor, and Upsher-Smith; has received royalties for Febrile Seizures and honoraria from Questcor, UCB, and Upsher-Smith; has received research funding from the National Institute of Neurological Disorders and Stroke and the Citizens United for Research in Epilepsy Foundation; and has given expert testimony. J. Hopp has received royalties from publishing from UpToDate and honoraria from lectures for UCB Pharma, has served on speakers bureaus for UCB Pharma and GlaxoSmithKline, and has given expert testimony. J. French has served as a consultant for Acorda, Biotie, Eisai Medical Research, GlaxoSmithKline, Impax, Johnson & Johnson, LCGH, Marinus, Novartis, Pfizer, Sunovion, SK Life Science, Supernus Pharmaceuticals, UCB, Upsher-Smith, and Vertex; has received grants from Eisai Medical Research, Epilepsy Research Foundation, Epilepsy Study Consortium, Epilepsy Therapy Project, Lundbeck, Pfizer, and UCB; and is president of the Epilepsy Study Consortium. All consulting is done on behalf of the Consortium, and fees are paid to the Consortium. New York University receives salary support from the Consortium. Go to Neurology.org for full disclosures. Clinical practice guidelines, practice advisories, systematic reviews, and other guidance published by the American Academy of Neurology and its affiliates are assessments of current scientific and clinical information provided as an educational service. The information: (1) should not be considered inclusive of all proper treatments, methods of care, or as a statement of the standard of care; (2) is not continually updated and may not reflect the most recent evidence (new evidence may emerge between the time information is developed and when it is published or read); (3) addresses only the question(s) specifically identified; (4) does not mandate any particular course of medical care; and (5) is not intended to substitute for the independent professional judgment of the treating provider, as the information does not account for individual variation among patients. In all cases, the selected course of action should be considered by the treating provider in the context of treating the individual patient. Use of the information is voluntary. AAN provides this information on an “as is” basis, and makes no warranty, expressed or implied, regarding the information. AAN specifically disclaims any warranties of merchantability or fitness for a particular use or purpose. AAN assumes no responsibility for any injury or damage to persons or property arising out of or related to any use of this information or for any errors or omissions. Approved by the Guideline Development Subcommittee on November 16, 2013; by the Practice Committee on January 20, 2014; by the AES Board of Directors on February 13, 2014; and by the AANI Board of Directors on December 1, 2014. This guideline was endorsed by the World Federation of Neurology on May 20, 2014, and by the American Neurological Association on May 21, 2014. Accepted in final form October 30, 2014.
. First seizure definitions and worldwide incidence and mortality. Epilepsia 2008;49(suppl 1):8–12. Institute of Medicine (US) Committee on the Public Health Dimensions of the Epilepsies; England MJ, Livermari CT, Schultz AM, Strawbridge LM, editors. Epilepsy Across the Spectrum: Promoting Health and Understanding. Washington, DC: The National Academies Press; 2012.
. Practice parameter: evaluating an apparent unprovoked first seizure in adults (an evidence-based review): report of the Quality Standards Subcommittee of the American Academy of Neurology and the American Epilepsy Society. Neurology 2007;69:1996–2007.
. The cost of epilepsy in the United States: an estimate from population-based clinical and survey data. Epilepsia 2000;41:342–351. Guidelines for epidemiologic studies on epilepsy. Commission on Epidemiology and Prognosis, International League Against Epilepsy. Epilepsia 1993;34:592–596.
. Newly diagnosed unprovoked epileptic seizures: presentation at diagnosis in CORALE study. Coordination Active du Réseau Observatoire Longitudinal de l'Epilepsie. Epilepsia 2001;42:464–475.
. Is a first acute symptomatic seizure epilepsy? Mortality and risk for recurrent seizure. Epilepsia 2009;50:1102–1108.
. Practice parameter: treatment of the child with a first unprovoked seizure: report of the Quality Standards Subcommittee of the American Academy of Neurology and the Practice Committee of the Child Neurology Society. Neurology 2003;60:166–175. American Academy of Neurology. Clinical Practice Guideline Process Manual, 2004 ed. St. Paul, MN: American Academy of Neurology; 2004.
. Seizure recurrence after a first unprovoked seizure. N Engl J Med 1982;307:522–528.
. Seizure recurrence after a 1st unprovoked seizure: an extended follow-up. Neurology 1990;40:1163–1170. First Seizure Trial Group (FIR.S.T. Group). 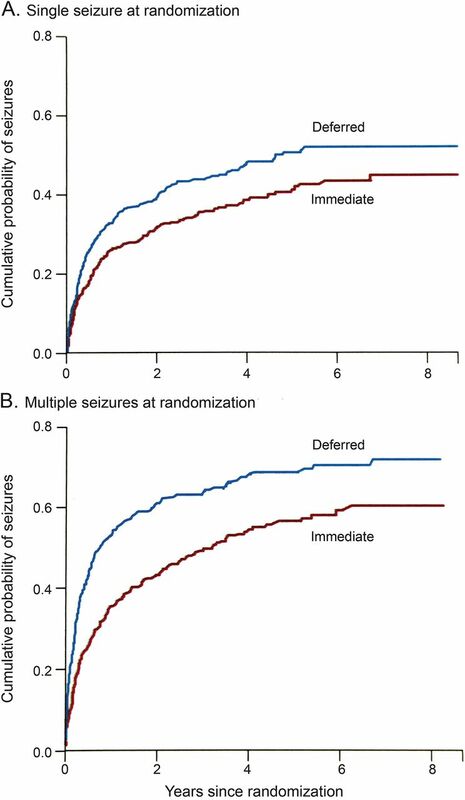 Randomized clinical trial on the efficacy of antiepileptic drugs in reducing the risk of relapse after a first unprovoked tonic-clonic seizure. Neurology 1993;43:478–483. ; First Seizure Trial Group (FIRST Group). Treatment of first tonic-clonic seizure does not improve the prognosis of epilepsy. Neurology 1997;49:991–998. ; FIRST Group. Treatment of the first tonic-clonic seizure does not affect the long-term remission of epilepsy. Neurology 2006;67:2227–2229. ; Medical Research Council MESS Study Group. Immediate versus deferred antiepileptic drug treatment for early epilepsy and single seizures: a randomised controlled trial. Lancet 2005;365:2007–2013.
. The first seizure in adult life: value of clinical features, electroencephalography, and computerised tomographic scanning in prediction of seizure recurrence. Lancet 1988;1:721–726.
. Risk of recurrence after first unprovoked tonic-clonic seizure in adults. J Neurol 1995;242:157–163.
. Risk of recurrence of seizures following a single unprovoked idiopathic seizure. Neurol India 2000;48:357–360.
. Risk of recurrence after an initial unprovoked seizure. Epilepsia 1986;27:43–50.
. First seizure presentation: do multiple seizures within 24 hours predict recurrence? Neurology 2006;67:1047–1049.
. First seizure in adults: to treat or not to treat. Clin Neurol Neurosurg 1992;94(suppl):S61–S63.
. Early treatment of a single generalized tonic-clonic seizure to prevent recurrence. Arch Neurol 1996;53:1149–1152.
. 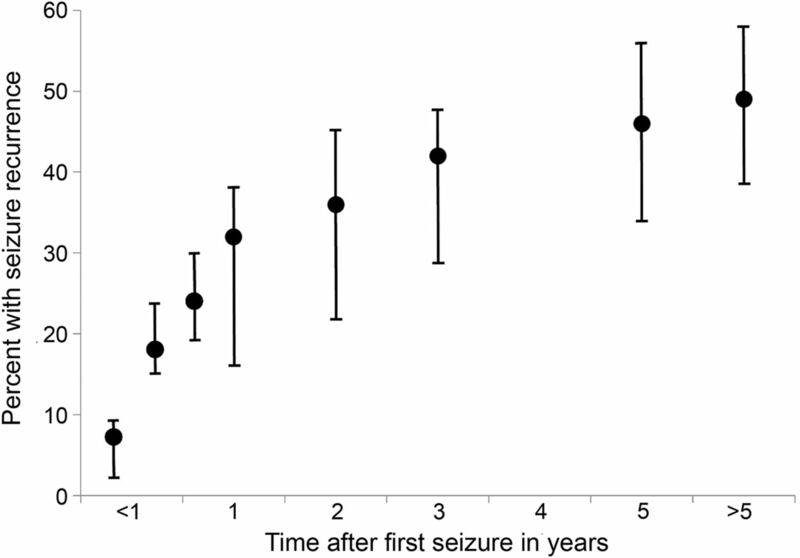 The risk of seizure recurrence following a first unprovoked seizure: a quantitative review. Neurology 1991;41:965–972.
. Risk of recurrence after a first unprovoked seizure. Epilepsia 2008;49(suppl 1):13–18.
. Recurrence after a first untreated seizure in the Hong Kong Chinese population. Epilepsia 2001;42:94–97. ; Medical Research Council MESS Study Group. Quality of life outcomes of immediate or delayed treatment of early epilepsy and single seizures. Neurology 2007;68:1188–1196. ; FIRST Group. Treatment of a first tonic-clonic seizure does not affect mortality: long-term follow-up of a randomised clinical trial. J Neurol Neurosurg Psychiatry 2011;82:924–927.
. Prospective study of seizures in the elderly in the Marshfield Epidemiologic Study Area (MESA). Epilepsia 2001;42:1594–1599. Agency for Healthcare Research and Quality (AHRQ). Management of Newly Diagnosed Patients with Epilepsy: A Systematic Review of the Literature (AHRQ Publication No. 01-E038). Rockville, MD: Agency for Health Research Quality, U.S. Department of Health and Human Services; 2001.
. Efficacy and tolerability of the new antiepileptic drugs I: treatment of new onset epilepsy: report of the Therapeutics and Technology Assessment Subcommittee and Quality Standards Subcommittee of the American Academy of Neurology and the American Epilepsy Society. Neurology 2004;62:1252–1260.
. Adverse antiepileptic drug effects in new-onset seizures: a case control study. Neurology 2011;76:273–279. ; CAPSS-272 Study Group. Efficacy, tolerability, and safety of rapid initiation of topiramate versus phenytoin in patients with new-onset epilepsy: a randomized double-blind clinical trial. Epilepsia 2010;51:1970–1977.
. Risk of recurrent seizures after two unprovoked seizures. N Engl J Med 1998;338:429–434.
. A practical clinical definition of epilepsy. Epilepsia 2014;55:475–482.
. How do we manage the first seizure in adults? J R Coll Physicians Lond 1995;29:289–294.
. The next step in guideline development: incorporating patient preferences. JAMA 2008;300:436–438. ; MRC MESS Study Group. Prediction of seizure recurrence after a single seizure and early epilepsy: further results from the MESS trial. Lancet Neurol 2006;5:317–322.
. Seizure recurrence after antiepileptic drug withdrawal and the implications for driving: further results from the MRD Antiepileptic Drug Withdrawal Study and a systematic review. J Neurol Neurosurg Psychiatry 2011;82:1328–1333. Authors' response to Dr. Lattanzi et al. Unprovoked first seizure: to treat or not to treat?